​Bob McDonnell, the former governor of Virginia, was sentenced by a federal judge on Tuesday to two years in prison for accepting lavish gifts from a wealthy donor while holding office. United States District Court Judge James R. Spencer announced his ruling just shy of 3 pm local time early on Tuesday, four months and two days after a jury there found Mr McDonnell and his wife guilty of public corruption charges. The Twitter account for the US Attorney's Office for the Eastern District of Virginia confirmed the ruling shortly after. Former Virginia Governor Robert McDonnell sentenced to two years in prison for violating federal public corruption laws. "I stand before you as a humble and heartbroken man,"McDonnell told the court on Tuesday ahead of the judge's decision, according to journalist Jeff Goldberg. "I can't fathom any deeper humiliation for me and my family"
Going into court on Tuesday, McDonnell faced a maximum sentence of 12 years. Judge Spencer unexpectedly reduced the outcome range during the hearing, however, and said the governor would only face upwards of eight years behind bars since he did not obstruct justice or accept more than a certain amount of bribes, according to Washington Post’s Matt Zapotosky. According to Kathy Hieatt, a reporter for The Virginian-Pilot, Judge Spencer sentenced McDonnell to two years on each of the 11 charges he was convicted of, but said he could serve them concurrently, citing the governor's military service and calling him a "good and decent man." After he is eventually release from prison, McDonnell will be on supervised release for another two years, Hieatt tweeted from court. Judge James Spencer said he gave Bob #McDonnell credit for being a "good & decent man" & serving in the military. Prosecutors sought a sentence of at least 10 years for the former governor, while Mr McDonnell’s attorneys hoped the court would consider probation and community service. His wife, Maureen, was found guilty of nine counts and is expected to learn her fate next month. Mr McDonnell’s counsel filed a ruling on Monday this week in which the court was asked to preserve the former governor’s freedom pending appeal since they planned to challenge the sentencing as soon as possible. 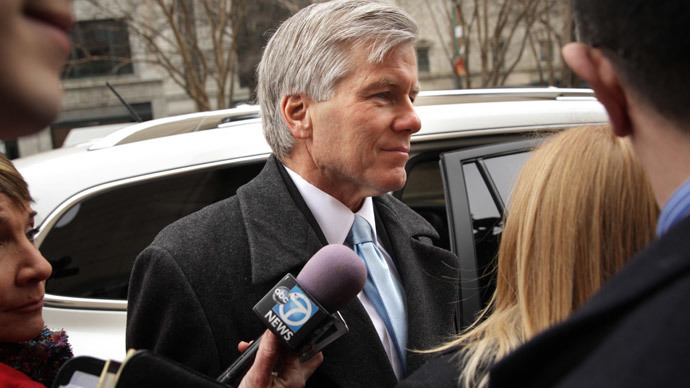 According to the Washington Post, McDonnell’s lawyers said their appeals will raise “substantive legal questions” during what the paperpredictedto be a “sure-to-be-lengthy” ordeal before the Fourth Circuit. According to Zapotosky, the Virginia Republican will have to report to prison by February 9. Judge gives Bob McDonnell two year sentence. Must report to prison by February 9. In September, the former governor was found guilty on 11 of 13 counts of corruption concerning exchanges he had while in office with Jonnie Williams Sr., the former chief executive of a dietary-supplement business who showered the McDonnells with roughly $177,000 in extravagant gifts and loans in exchange for government favors. Mr McDonnell, 60, served as a Republican member of the House of Delegates from 1992 to 2006, then served one term as the state’s attorney general before successfully running for governor in the 2009 elections. McDonnell’s only term as governor of the commonwealth concluded on January 11, 2014, and a grand jury indicted him and his wife only 10 days later. Since September, Judge Spencer has received nearly 450 letters urging leniency with regards to sentencing the governor,according to Politico, and appeals from the likes of US Sen. Tim Kaine (D-Virginia) and former House Majority Leader Eric Cantor, a Virginia Republican. “I can say with no uncertainty that Bob McDonnell is the most ethical, honest and faithful public servant I have ever worked with,” Phil Cox, a former McDonnell aide who later led the Republican Governors Association, stated in a letter to the court, according to the Wall Street Journal. “His promising political career is over, he is virtually bankrupt, his family is in a shambles and he and his family have endured more public humiliation than any family should have to endure, regardless of what they are accused of doing,” pleaded Joseph F. Damico, a friend of the governor’s since high school. But Robin Trujillo, a juror during the corruption case, told WVEC that she was disturbed by the pleas. Adam Lee, the head of Richmond FBI office, said after Tuesday's hearing that there would be no "victory lap" for the bureau, but acknowledged"an abiding sense that we did the right thing," according to Times Dispatch reporter Graham Moomaw.